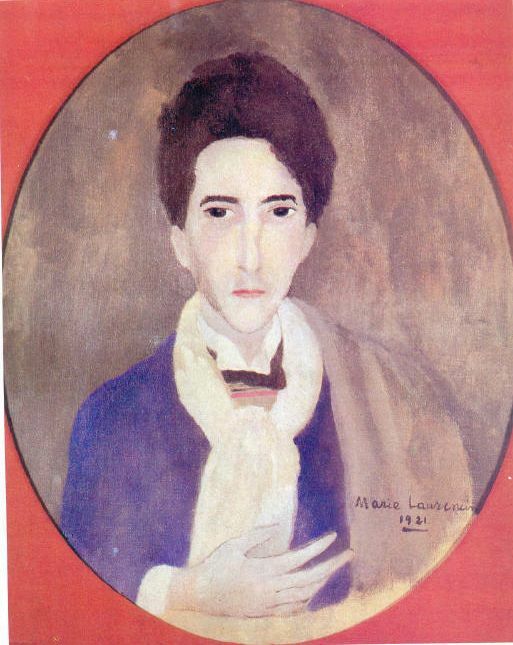 The poet, writer and critic Guillaume Apollinaire was an influential figure in early twentieth-century artistic circles. 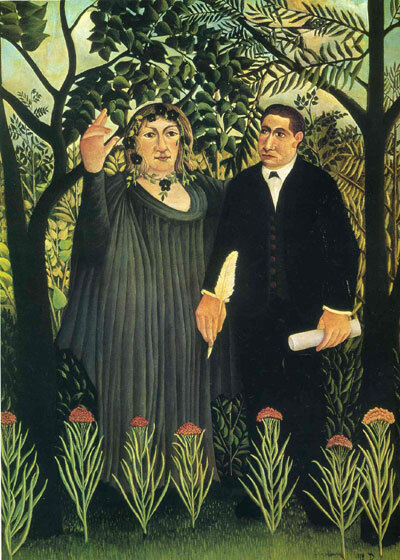 For the last few years of Henri Rousseau’s life, Apollinaire was one of his staunchest supporters, and wrote in praise of his work. 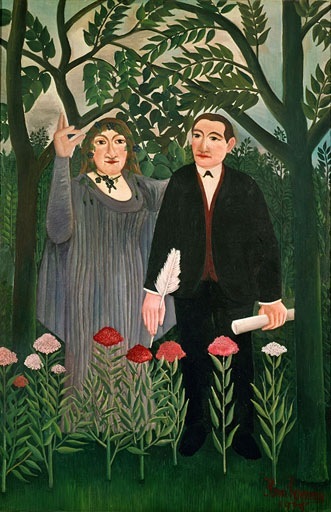 In 1910, shortly before Rousseau exhibited his last great painting The Dream 1910, he appealed to Apollinaire: ‘You will unfold your literary talent and avenge me for all the insults and abuse I have experienced.’ Rousseau made two versions of the double portrait of Apollinaire with his mistress Marie Laurencin. He grandly titled it The Muse Inspiring the Poet (1909). at the gaming tables all day. Leave Mother out of this! bird a bit like us? the arms a bit cracked. and ruins the floor for dance. On March 10, 2002 the music from act II of Gertrude Stein Invents A Jump Early On was workshopped presented under the sponsorship of the National Opera Association and Opera Index at the Manhattan School of Music in New York City in a program entitled New American Opera Previews: From Page to Stage. Gertrude Stein Invents A Jump Early On–three portraits of Gertrude Stein’s life and work from 1908-1944 as researched and embellished by poet-librettist Karren Alenier. Piano and voice score are completed. Music might be characterized as a fusion of new classical music and jazz. Presented by Encompass New Opera Theatre and Nancy Rhodes, artistic director. C’est toujours la meme que je vois. Une rose, c’est quelque chose. It is always the same one that I see. 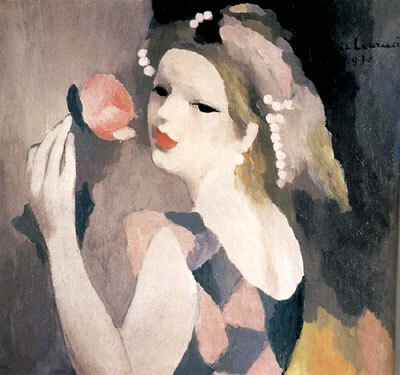 Marie Laurencin (October 31, 1883 – June 8, 1956) was a French painter, poet and printmaker. She was born in Paris, where she was raised by her mother and lived much of her life. At 18, she studied porcelain painting in Sèvres. She then returned to Paris and continued her art education at the Académie Humbert, where she changed her focus to oil painting. 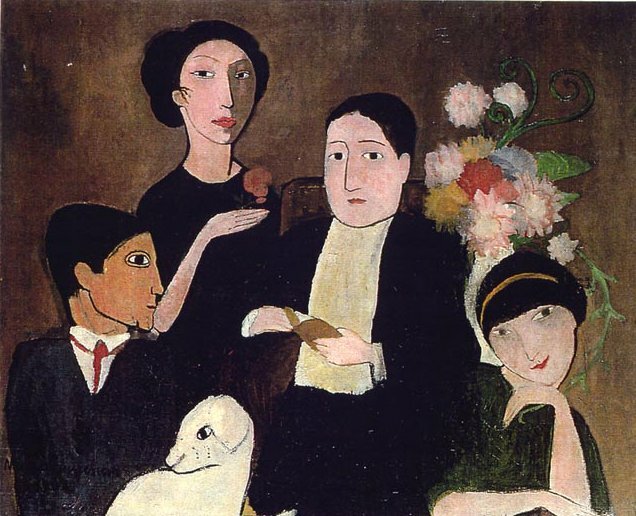 Disciple of Henri Matisse, during the early years of the 20th century, Laurencin was an important figure in the Parisian avant-garde. 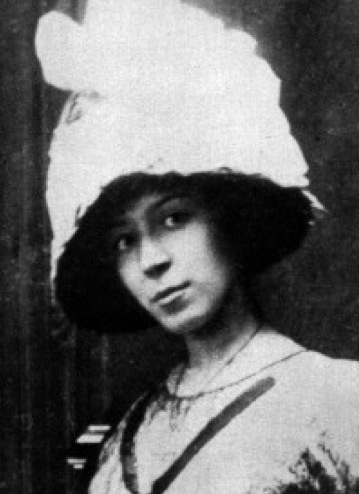 A member of both the circle of Pablo Picasso, and Cubists associated with the Section d’Or, such as Jean Metzinger, Albert Gleizes, Robert Delaunay, Henri le Fauconnier and Francis Picabia, exhibiting with them at the Salon des Indépendants (1910-1911) and the Salon d’Automne (1911-1912). 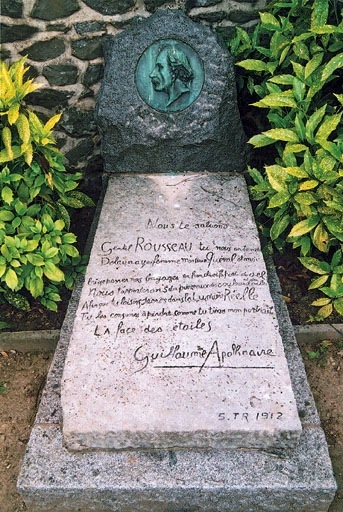 She became romantically involved with the poet Guillaume Apollinaire, and has often been identified as his muse. 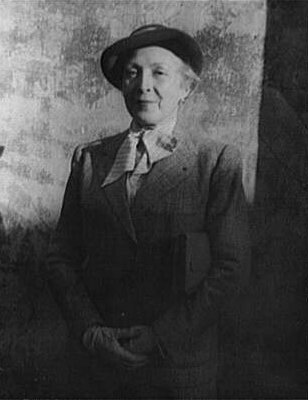 In addition, Laurencin had important connections to the salon of the American expatriate and famed lesbian writer Natalie Clifford Barney. She had heterosexual and lesbian affairs. 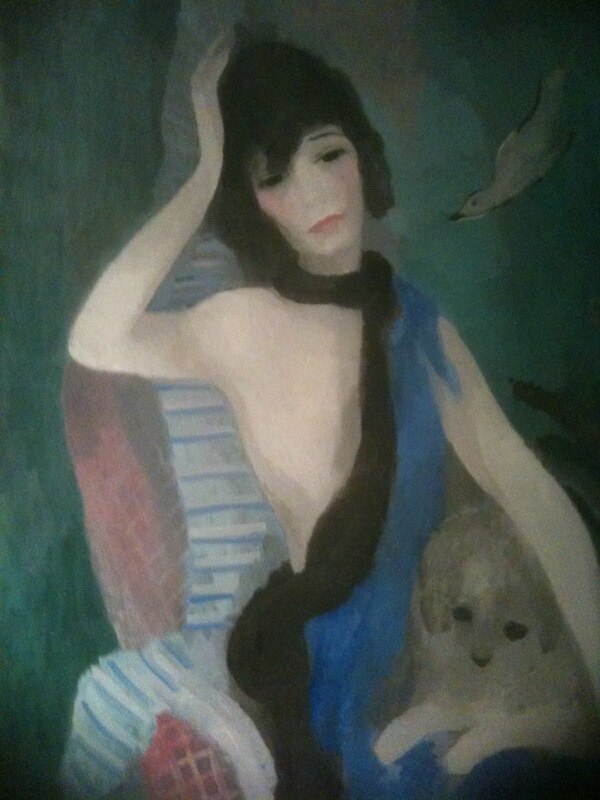 Laurencin’s works include paintings, watercolors, drawings, and prints. 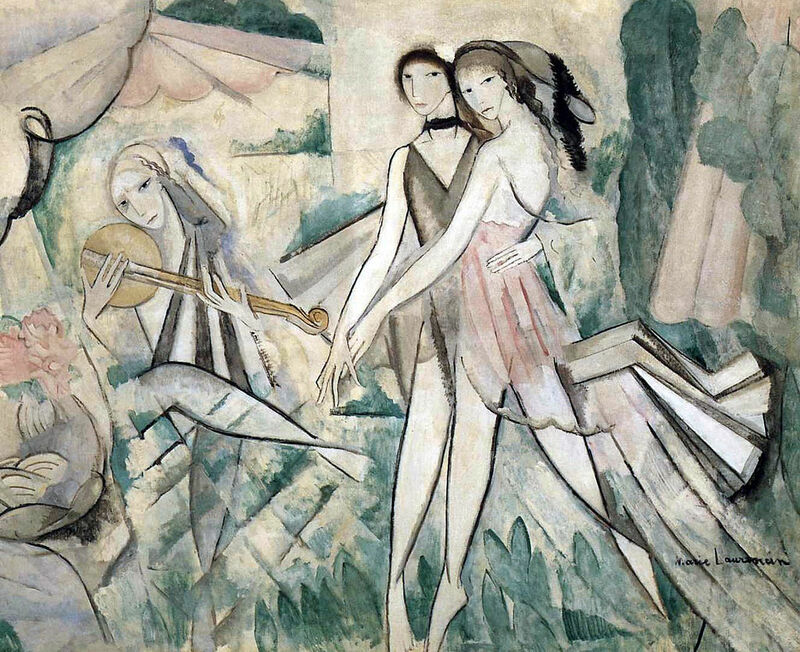 She is known as one of the few female Cubist painters, with Sonia Delaunay, Marie Vorobieff, and Franciska Clausen. 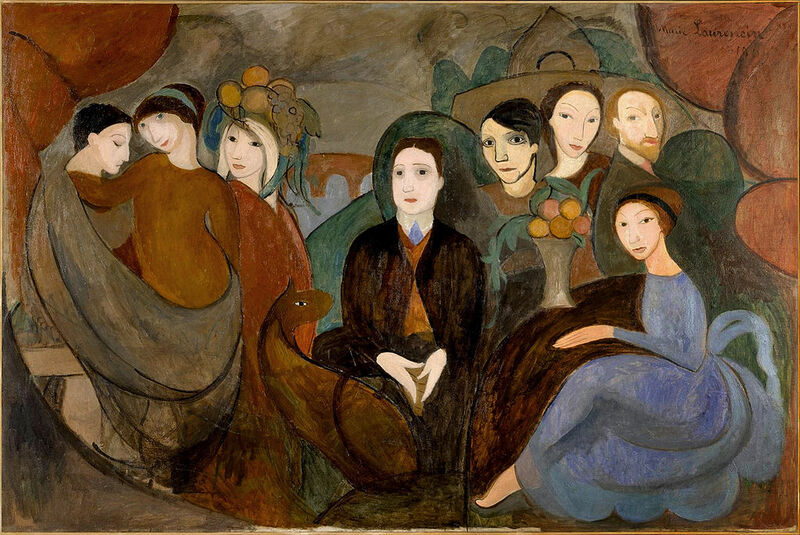 While her work shows the influence of Cubist painters Pablo Picasso and Georges Braque, who was her close friend, she developed a unique approach to abstraction which often centered on the representation of groups of women and female portraits. Her work lies outside the bounds of Cubist norms in her pursuit of a specifically feminine aesthetic by her use of pastel colors and curvilinear forms. 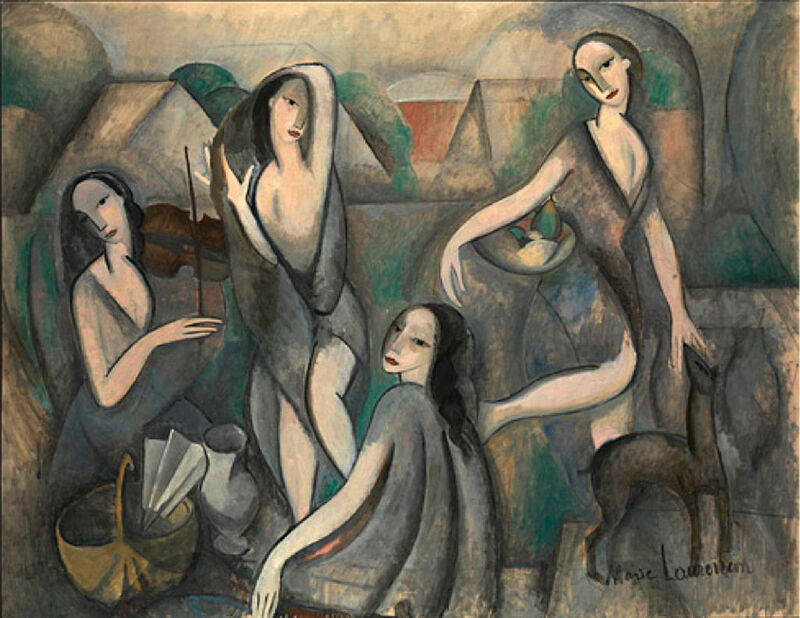 Laurencin’s insistence on the creation of a visual vocabulary of femininity, which characterized her art until the end of her life, can be seen as a response to what some consider to be the arrogant masculinity of Cubism.